Effective immediately, each U.S. KFC will replace customers' food if it is not "Colonel quality," or up to the standards Colonel Sanders put in place when the restaurant's first franchise opened in 1952. NEW YORK: KFC is reintroducing its employees to the cooking standards and philosophies Colonel Sanders put in place when the restaurant’s first franchise opened in 1952 in a push the chain is calling its "re-Colonelization." 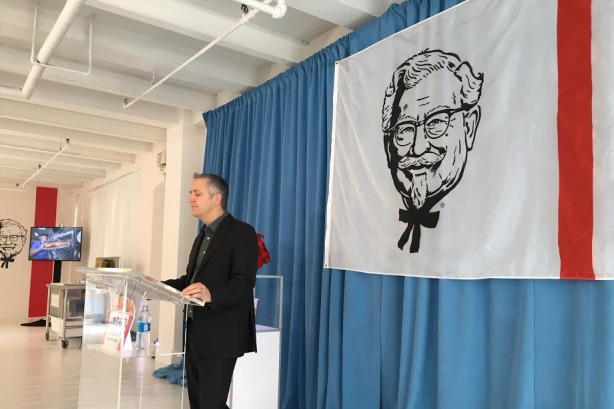 KFC U.S. president Jason Marker said at a New York event on Monday that the chain has not been living up to Sanders’ cooking standards for the past 10 years. He compared the brand to a once-great football team that now has fans asking, "What are you guys doing?" "We are not making the food the same way the Colonel had, and we are not making the food the way he described as the ‘hard way,’" said Marker. "Today marks the end of that." He added that KFC, along with its 500-plus franchisees, is publicly re-committing to "re-Colonelization," a word Sanders himself coined in 1971 when the company underwent a similar change. The chain has invested 100,000 hours in retraining its staffers, including cooks and managers on specific cooking processes. KFC has also held 43 rallies across the U.S. with managers and conducted in-store training in 4,300 restaurants. Marker said KFC restaurant managers have taken a personal pledge to return the brand to its "rightful leadership position." Comedian and former Saturday Night Live cast member Rachel Dratch held an on-site demo at the event with a KFC cook, who explained that the brand cooks chicken "the hard way." The cook added that KFC’s process is a slow one – it takes 25 minutes to cook KFC chicken, similar to how someone might make it at home. "Recommitting to the hard way is our opportunity to get back to our former glory," said Marker. Effective immediately, each KFC in the U.S. will have to replace customers’ food if it is not "Colonel quality," Marker added. "We are so sure our customers will once again fall in love with the KFC brand that for the first time we are giving customers a taste guarantee," he explained. KFC’s "re-Colonelization" announcement is part of a broader brand-turnaround strategy. The company has committed to remodeling 3,000 restaurants in the next three years. It also backed an extensive ad campaign featuring different celebrities playing Colonel Sanders to bring back the mascot and his values in a "fun and contemporary" way. Edelman supported KFC on Monday’s event. The firm has been working with the brand since January, when it ended its relationship with Emanate, which had served as KFC’s consumer and corporate PR AOR in the U.S. since 2012. Since KFC brought Colonel Sanders back into its marketing last year, the Colonel has been played by Darrell Hammond, Norm Macdonald, and Jim Gaffigan in ads. Dratch told PRWeek she doesn’t think she’s in-line to personally play the Colonel – in any ads, at least. "In my dreams, I have plans to be the next Colonel, but I don’t believe [that is the] plan," she said. "Just at home in my living room, where I often dress as the Colonel."